Gubernatorial candidates Walker Stapleton and Jared Polis square off for a debate Oct. 17 in Fort Collins. The state's gubernatorial race grew a bit more heated Wednesday night on a debate stage at Colorado State University. 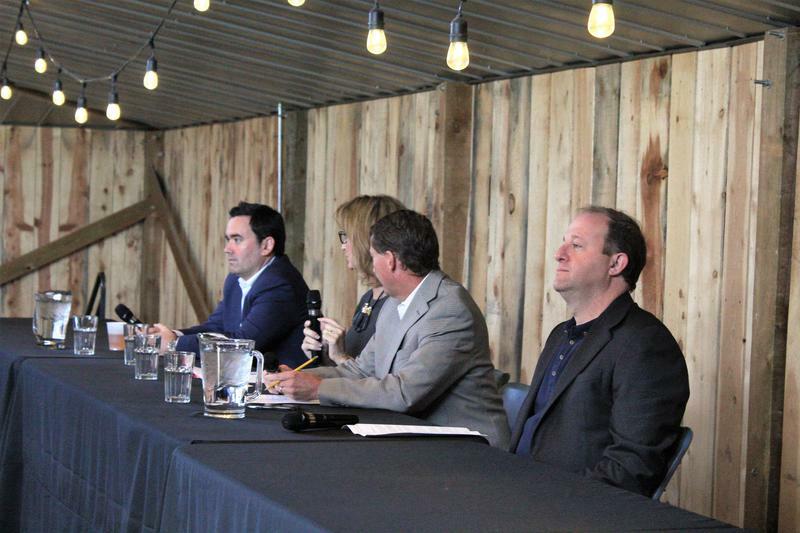 Republican candidate Walker Stapleton ignored the moderators' questions about statewide issues late in the debate as he repeatedly criticized Democrat Jared Polis for an incident that occurred nearly 20 years ago. Polis said he was acting in self-defense when he pushed a woman who was trying to steal sensitive documents from his company in 1999. He added he doesn't think the incident is relevant to the governor's race. "It's sad to talk about," Polis said early in the debate. "I don't think it's politically relevant." But nearly an hour after Polis first answered questions about the incident, Stapleton wanted to repeatedly raise the issue. "It is inexcusable to ever push a woman, regardless of the circumstances," he said. The tangle over the 1999 incident came after Polis was asked whether Democratic lawmaker Jovan Melton, who has been arrested twice in the last two decades on domestic violence charges, should resign. Polis said Melton needs to look in the mirror and seriously considering resigning. But he said the decision ultimately lies with voters. Polis and Stapleton also continued to clash over energy, transportation and abortion policies. Stapleton touted his plans to use the proceeds from sports gambling in Colorado to help fund road repairs. Polis said his pledge to have the state using 100 percent renewable energy in 2020 was Kennedyesque. He didn't think it was that different from John F. Kennedy pledging the United States would send a man to the moon back in the 1960s. Wednesday's debate came hours after the Stapleton campaign got some bad news about the latest polling numbers. A survey of registered voters by the right-leaning firm Magellan Strategies found Polis leading Stapleton by seven percent. Polis also had a commanding lead over Stapleton with unaffiliated voters. That subgroup of voters usually decides elections in Colorado. There are other signs Stapleton is the underdog of the race as Election Day approaches. Polling site Fivethirtyeight.com gave the Republican just a one in 12 chance of winning the race based on recent polling. The gubernatorial debate marathon is almost over. Stapleton and Polis will both speak Friday at a forum in Greeley. Their last chance to speak directly to voters is Tuesday night in Denver. All week the Aspen Public Radio News team is bringing you candidate debates, and breaking down the ballot measures that YOU will be voting on. Get informed, and then mail in your ballot. All week the Aspen Public Radio News team is bringing you candidate debates and breaking down the ballot measures that YOU will be voting on. Get informed, then mail in your ballot.